The Brain Power! Club was sad. Brain Teaser hasn't been able to make it to the club for a couple of days because he sprained his ankle. Brain Wave said that Brain Teaser's mom wants him to stay home and rest. He also said that Teaser’s mom gave him some aspirin for the pain. Then, they heard the familiar "Computer Alert! Computer Alert!" Corty jumped out of the computer screen and landed next to the microscope, where Brain Trust was looking at tiny creatures magnified 50 times. "What's up, guys?" said Corty. "We're just talking about poor Brain Teaser," said Brain Trust. "He can't be here today because he hurt his foot. But his mom gave his some Tylenol, and he's feeling a lot better now." "Funny you should mention Tylenol," said Corty. "Today's mission involves aspirin and other substances. In fact, the whole idea is to get you kids thinking about the difference between drugs used as medicines and drugs used for other purposes." "Wow, I never thought about that," said Brain Trust. "What are the differences?" "I don't want to tell you too much because then it will give the mission away. But there is something important you should know." "What?" said Brain Trust and Brain Wave together. "Pay attention to who gives you medicine," said Corty. "You don't want to take it from just anyone." "He's right," said Brain Trust and Brain Wave together. "Oh, and there’s one more thing I forgot to mention. 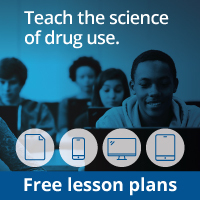 You will be learning about medicine and drugs through riddles." "Riddles!" said Brain Trust. "Can you give us an example?" I’m brown, sweet, sticky, and with me a mess you can make. "Oh, I see," said Brain Wave. "The answer to that one is syrup. We'll have to answer riddles about Tylenol and other things like that?" "You got it," said Corty. "Now I really must go. Good luck with the riddles." "Thanks. We're off, ready to meet our latest challenge."